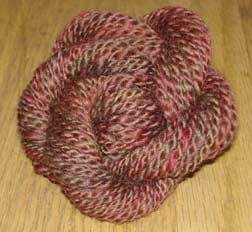 This was spun from some lovely hand dyed merino wool from Jill Draper Makes Stuff. If we ever see the sun around here, I'll take some post soaking photos. I've had my current computer for over a year now and yet there was no "spinning" folder. In other words, it's been a heck of a long time since I completed any spinning. 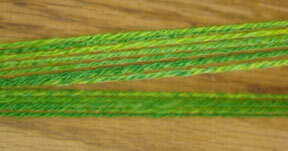 As I was out of practice (and watching LOST episodes while spinning), this yarn is a bit funky, but who cares! It's screamingly pink and purple -- over the top saturated and I love it. The color on this photo is off, but I couldn't resist a macro shot. 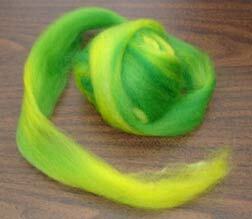 BTW, the wool was from Fiber Optic Yarns and is a 80% superwash merino/20%nylon. It is called Foot Notes Unspun! pencil roving. Clearly I did not spin this up as a sock yarn, but once again -- who cares! It just might make some soft squishy mittens, which is fine by me. So I wasn't all that excited to ply it up. I figured that I just wasn't going to like this yarn and that sometimes that happens. I'd live with it. 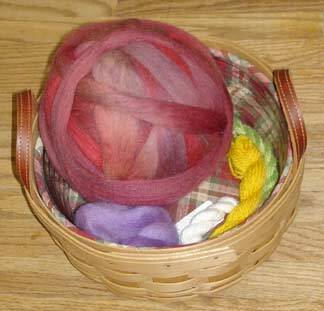 Then I plied it. . . whoa! 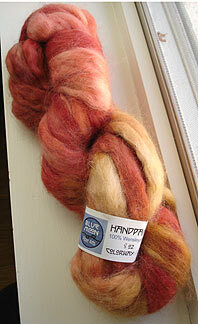 All the great color combos I saw in the unspun fiber came back and looked even better then I remembered. The singles which looked so minty green to me became golden and warm. I guess this is a reminder that you never know what will happen when you spin up fiber until you actually see it completed. 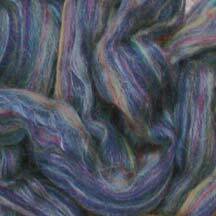 Up next is more fiber from Spunky Eclectic -- Corrie in the Orchard colorway. It's been very busy around here the last week, preparing for the 7th Annual Tim Klotz Memorial Golf Outing which was held on Tuesday. It's exhausting emotionally and physically, but it raises a nice bit of money for local charities and it also gets together a lot of my Dad's friends so that they can chat about him and recall his antics which is always fun. I've also got a weaving project on the loom and Maddie's socks are almost finished! Two incredible books arrived on Tuesday too, so I need to review them. Oh my goodness, I have a lot to do! 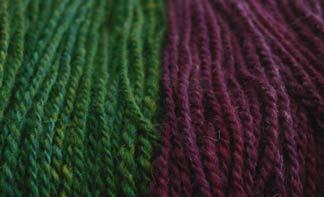 After plying I ended up with a nice soft, drapey yarn. 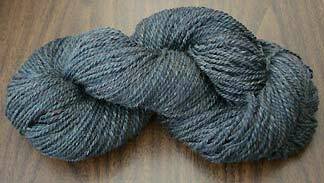 And I still have a respectable 84 yards or so from my 2 ounces of fiber. I should be able to find something to knit out of that. 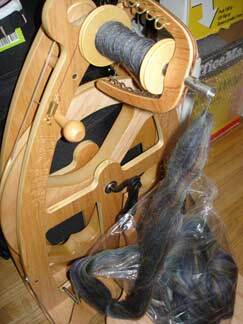 You may see a bit more spinning on the blog in the next month or so. I finally picked up my copy of The Alden Amos Big Book of Handspinning that has been lying around unread for ages. Just reading through it has given me the spinning bug! Yesterday Theresa & I went out to The Fold to check out the spinning guild meeting and enjoyed a lovely day of spinning (more on that later.) While I was there I spotted the Ashford Knitter's Loom! Now, I'm planning to do a podcast about weaving so I'll talk a lot more about this fun toy, but I had to show it off a bit here. First let me tell you that I had been lusting after one of these ever since I saw that Ashford had come out with them, but it was Syne Mitchell's endorsement on her last podcast (Weavecast -- check it out!) that put me over the edge. And after that I was good to go and started weaving! Just look what I did in one night after a long day of traveling out to Marengo, spinning all day and getting home rather tired. I thought I might be too worn out to give it a try, but Pete encouraged me to go for it and in under an hour I had it all set up, warped up and was weaving! 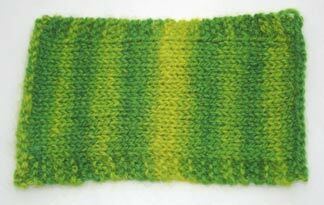 The first project that they have you start with is supposed to be a scarf, but I think I want to make this into a little bag and maybe a couple mug mats. We'll see. 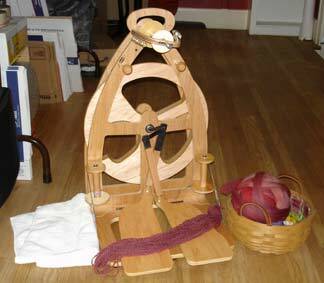 It's a lot of fun and I'm looking forward to lots more projects on my little rigid heddle loom! It's so shiny because of the silk, that it's a bit difficult to photograph. I'll try to take a better picture once it's soaked. 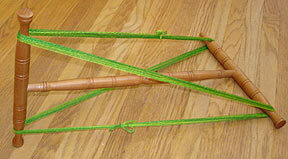 Now I'm off to play with my loom some more! Stitch-Cast is on hiatus this weekend I'm afraid. So I was kind of excited to spin up this strange stuff. I guess it's rather rare and the wool is supposed to be pretty nice stuff. According to the American Sheep Industry Association the average fiber diameter is 22-25 micron and the staple length is 3-5 inches. Not bad. Well, the roving I had was, how shall I say, rather less "prepared" than I'm used to. It had quite a bit of VM throughout and there were places where there were clumps of very short fibers. I also thought the fibers were less combed or carded than I'm used to -- plus this particular breed has quite a bit of crimp to it's wool. It just wasn't that pleasant to spin. 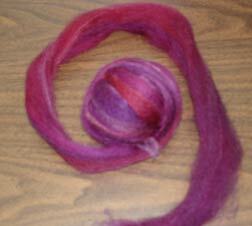 And I found myself putting more spin into the wool just to keep it together because of the clumps of short fibers. I would give the CVM another chance if it was prepared in a different manner. Next time I sit down to spin I may try 100% alpaca! There's been some sitting in the stash for ages, but I've been scared to try it. Yesterday Theresa, Bonne Marie and I spent a fun day out in the country. Yep, three city girls out in the country! 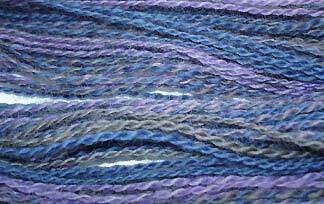 We journeyed out to Marengo to that most wonderful of fiber shops -- The Fold! I did find the wheel of my dreams, but didn't purchase it (a Lendrum black walnut Saxony, for those who are interested). I tried out lots of other wheels too -- mostly because Theresa was looking for a wheel and since she was pulling them all out I had to give them a try too; and I have to say it was a lot of fun. 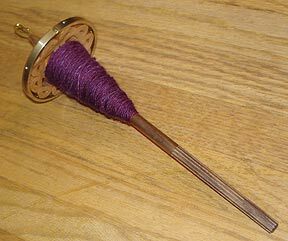 The only wheel I had ever spun on was my Ashford Joy which I purchased through the mail having never spun on a wheel in my life - *gasp*!! Oh yeah. . . I was going to tell you about the Wensleydale, wasn't I? 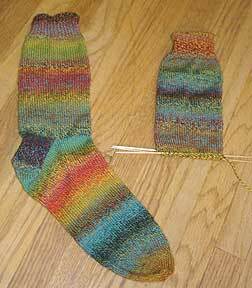 Well, there wasn't a single solitary skein of Socks that Rock in the entire shop -- can you believe it? I think we hit it right in between the old put up and the new, so maybe that's the problem. I didn't walk away without anything from Blue Moon though! See that gorgeous fiber up top? That's some Wensleydale (so I finally get to the Wensleydale. . . ) in the "Flintstone" colorway. Now I'm very impatient and today I already tore a chunk off and spun it up on the Joy, made a center pull ball and two plied it. Here's the results. . . The Wensleydale is a handsome sheep with long, lustrous locks. 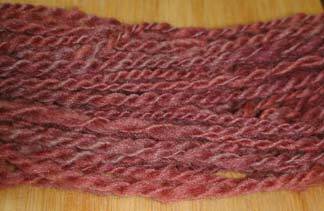 Unlike a BFL or Merino, the wool isn't really all that springy. 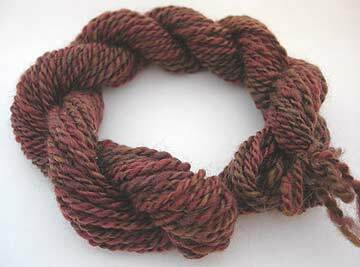 I would describe it more as a drapey wool and I believe it is used in weaving quite a bit although I saw on some site that it makes lovely, durable socks. Hmmmm. . . . 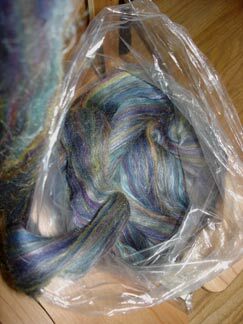 It was very nice to spin up and reminded me a bit of my experience with Romney, although the Wensleydale is much finer and quite softer. 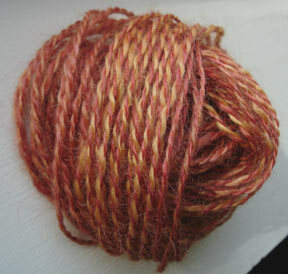 I haven't given my little sample skein it's bath yet, but I'm hoping it will soften up even more with a good washing. Other goodies were purchased, including some things that should help me to get my loom up and running. My last attempt at weaving was somewhat of a disaster, but I am now armed with Learning to Weave and a woven scarf kit from Blue Moon. 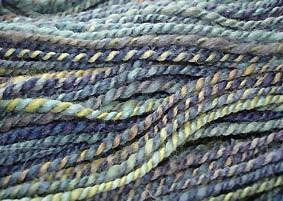 I was up late last night reading all about warping the loom -- how exciting! 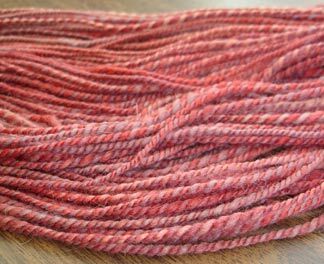 Guess I better run because I had a bit of BFL on a spool that I quickly plied before spinning up the Wensleydale and I figured, why set the twist when you can set the twist and kool-aid dye at the same time? Well, I just remembered that I threw the skein in a pyrex measuring cup with a couple packets of kool-aid & some hot water about 3 hours ago. Must go see what it looks like! ** Update ** Well, I checked out the kool-aid dyed mini skein of BFL and it's kinda dark pink and very fruity smelling despite *many* rinsings -- some which included soap. The "dye bath" was a super dark red and this is all I get? And every rinsing brings me more bleeding. I tried kool-aid dyeing once before with equally sketchy results. Think I'll stick to the lanaset dyes in the future. Yesterday Theresa & I had a great time visiting The Fold and ended the evening with a wonderful dinner with our husbands. So it was a good morning for being lazy. Instead of making Pete go out and forage for breakfast as he usually does on Sunday mornings, I decided to mix up some scones. 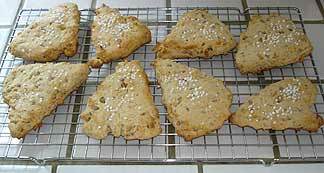 I got some great King Arthur Flour scone mixes from Elaine in trade a while back, and they are really easy and good! 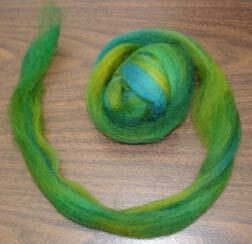 I already started to spin up one of my purchases -- some blue merino/kid mohair. 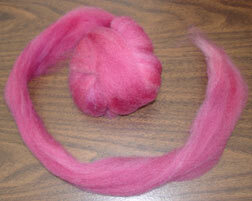 I don't think I've ever spun Merino before, so it took a little getting used to, but I really like it. It isn't a solid blue. . . It's a little bit darker than it looks in the picture. After I ply up some of it I'll post pictures. And one last thing -- Deanna, from my knitting guild, wanted me to mention the Heartland Knitting Retreat that she is putting together. Annie Modesitt is one of the featured teachers! And Deanna taught the workshop on needle felting at our guild meeting in May which was a lot of fun. The retreat is in December and there is more info at her website. 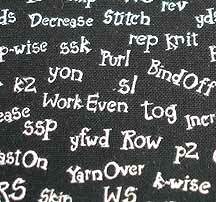 Tomorrow I will show off my latest Black Sheep Bags design -- the Carroll Bag -- named after my mom. Since yesterday was super busy and I had no time for crafting (other than the 2 rows I did on my sock in the doctor's waiting room), I am going to re-hash yesterday's pathetic post by putting a new spin on it. I'm going to discuss digital photography. . .
Now I own a Sony DSC-W1, 5.1 mega pixel camera. I love it and it takes much better pictures than my last camera (an HP something or other -- 3 mega pixel, I believe), but I find that I only get *really* good pictures if I use a tripod and the slow speed setting. (I think that's what it's called. It says SL and has the little "flash" lightning bolt after it.) The above picture is taken using that method. For yesterday's shot I didn't use the tripod and you can see the difference! However, at the top of today's picture you see that I did get a bit of over-exposure. (I'm throwing around photography terms like I know what I'm talking about!) This is a big problem I seem to have with this camera. But I have been inspired to do better. I read Felicia's blog, Sweet Georgia and her photographs are beautiful! I love looking at her blog. So I am going to aspire to be more like her and I am going to try to work on my photography skills. Anyone know some good online resources for digital photography tips? I'm off to get caught up on pattern orders!